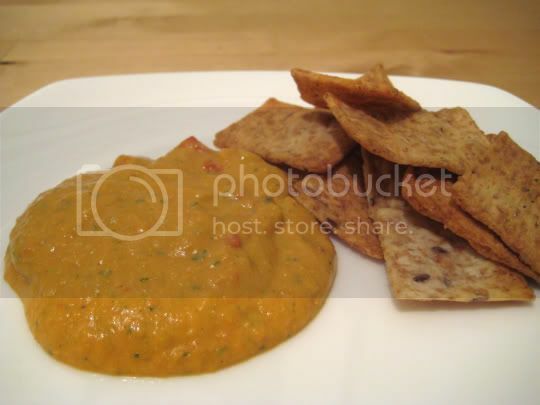 I'm not a huge fan of anything overly bell pepper-ish, but this hummus-like dip is surprisingly good. Maybe it's because the peppers are roasted, or maybe because an entire can of beans went into the dip (which added a great texture), or maybe the pureed tofu helped it mellow, or maybe the always delightful flavors of lime and cilantro helped to add some zip and zing. The one clove of garlic also stood out quite a lot, and the bit of cumin added wasn't overpowering, and added a nice smokiness to the roasted pepper flavor. This dip was extremely easy to make: place everything into a blender and whirl away. In less than 10 minutes, you're done and you've got a great entertaining snack. I wouldn't even suggest any improvements or changes to the recipe, it was fine as is. Add some pita or tortilla chips, and you're good to go! Make again? Yes. This would even be good as a sandwich spread.